Over the weekend of 8th /9th October, 32 x 14ft catamarans assembled for the 7th, 14ft Cat Regatta. Boats arrived from Brisbane, Wagga, Wollongong, Tumult, Sydney, Newcastle, Speers Point and Tangible Bay. Local club sailors were strongly represented. 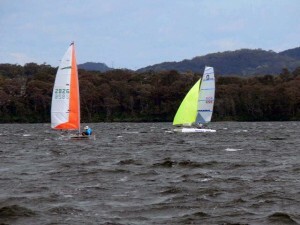 The fleet quality was high with current state, national and world champions ,veteran sailors such as Ian Marco itch, Frank O Bourke, the master Bob Simpson, Warren Pfeiffer, Sergeant Major Wilson, the Pirate Peter Broaden, shy retiring and humble Mick Colecliffe, Phil Johnston, and the sultan of sail, Michael Pfeffer. Youth were present in short numbers but made up for it with courage to sail amongst a big quality fleet, young Ryan Dudman held his own amongst the fickle winds and talented fleet for the first four races before retiring from the strong winds. While young Billy Breaden mixed it in the early races with good positioning within the fleets. The Nacra 430 was stunning in the reaches with asymmetric spinnakers, searing speeds heading for the wing marks. Flurries of arms and legs at the leeward marks resetting for the work to windward. These boats were driven hard on Sunday by Brisbane sailor and Nacra catamaran boat builder Warren Guinea in up to 25 knot westerly bullets. It takes a lot of ticker to pull the spinnaker halyard out in these gusty heavy winds. 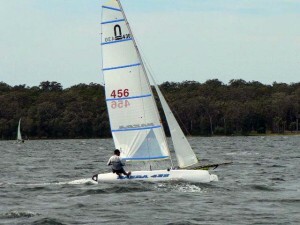 Jim Bennet, a seasoned cat sailor from Brisbane sailed his Nacra 430 to convincingly win in Race 4. 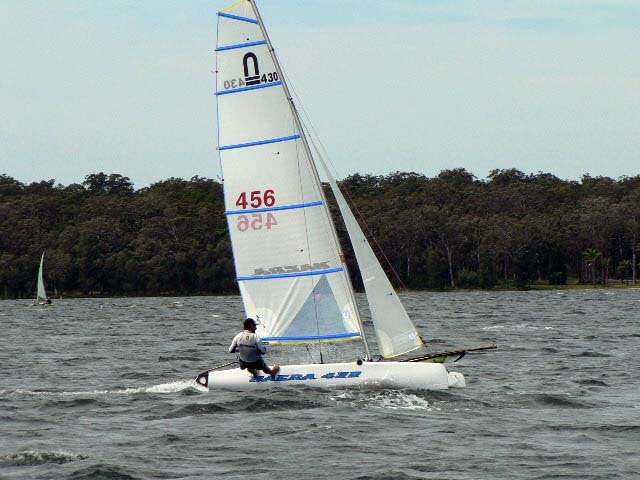 Chris Stevens, Club Captain, Concord Sailing Club sailed his Nacra 430 with distinction. Local adopted son of MPASC, Ian Lamb, (but has a holiday house in Sydney), dug deep and went the distance on all the races, including the last heart breaking race on Sunday when only 14 of the 32 boats managed against the gusting westerly to complete the race. The Nacra 430 managed to win 4 out of the 7 races over the line some by big margins, including a light race plus the windiest race on Sunday afternoon, which was a great achievement considering the courses did not favor the boat with triangle courses being sailed. It was always going to be hard to win these races with small triangle courses set in very shifty and tricky conditions that would suit the boat. Plus sailing against current, national and world champions on the perspective boats. The Nacra 430 managed to win one of the races on yardstick and finished 4th overall and 2nd on Handicap, which is a great result for the boat since it is just over one year old. And has the lowest yardstick on boats competing at the event. It was a great event with very strong competition and was great to see so many 14ft boats still sailing. We will be there with more Nacraâ€™s next year.